You are here: Home » It’s Official! 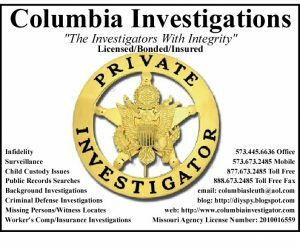 Melinda is the owner and lead investigator of Columbia Investigations. A graduate of the University of Missouri at Kansas City, Melinda holds a Bachelors Degree in the Administration of Justice, earning the Edward Tomich Memorial Award and Honors from Alpha Kappa Delta, the International Sociology Honor Society. In addition, she was one class short of a Bachelors Degree in Psychology and plans to continue Graduate coursework in Psychology and Law.